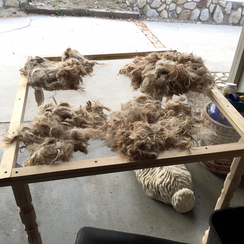 Fleece is cleaned and vegetable matter removed on a skirting table. The most frequent question we get is "What do you do with your alpacas?" "Do you do anything with their wool?" "Do you eat them?"... I could go on and on with the many different questions that we hear. What do we do with our alpacas? Well to start with, they are part of our family. Amazing, intelligent and soulful animals that enrich our lives every day. 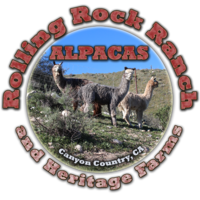 But they are not just members of our ranch, we also raise them to sell to other alpaca owners. But most importantly we raise them for their fleece. Alpaca is one of the softest and most luxurious of all animal fibers. Warm, comfortable, not at all itchy, and hypoallergenic; it makes a great natural for fiber for many uses and people that have allergies or other issues with natural fibers. Why Hand Process the Fleece? While there are min-mills that will process the raw alpaca fleece into roving, yarn, felt and other products; I really wanted to understand the process of preparing the fleece and taking it from a raw resource to a final product. I grew up crocheting, so this was really a great opportunity. So I learned to hand process, hand dye and hand spin the fleece from our animals. What I wasn't expecting was the rewarding sense of having produced something with your own hands for animals that we raised on our ranch. 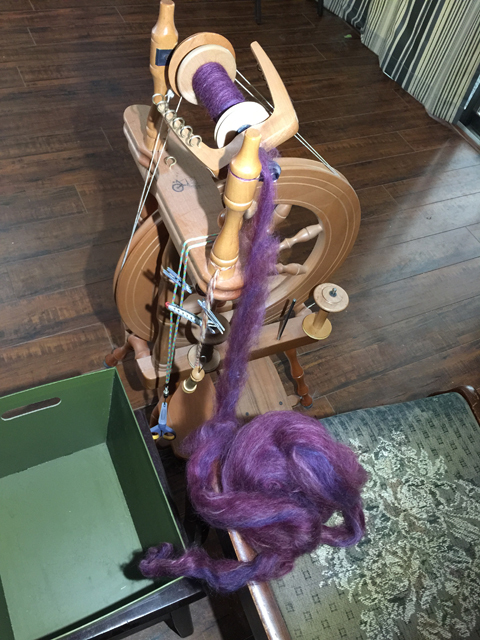 I wasn't expecting to find that spinning fleece was going to be a relaxing way to end the day, giving my mind a break from a busy day in the tech world while getting lost in the meditative state that results from this cyclical activity. How do we Hand Process our Fleece? There are a number of steps that happen from between fleece growing on the alpaca and the final skeins of yarn. Shearing day comes once a year in late spring. It's a group activity where the alpacas are carefully restrained to make sure they are not going to be hurt by sharp clippers. Their fleece is carefully sheared off. The alpacas are not harmed at all and they usually appreciative of being much cooler going into the summer. Alpacas LOVE to roll in the dirt and hay, so their fleece usually needs a bit of a cleaning. The raw alpaca fleece is place on a wire mesh table, called a skirting table. Bit's of hay and other vegetable matter is shaken and picked out. Dust and other debris falls through the mesh while leaving slightly cleaner fleece. Then as a last step the fleece is washed. It's now ready to dry or can be dyed. There are a lot of different ways to dye fleece, but my favorite method is called kettle dying the raw fleece. The fleece is placed in warm water and fun dye color are added. Citric acid is added to get the dye to bond to the fleece. The pot is slowly heated and held right under a simmer. 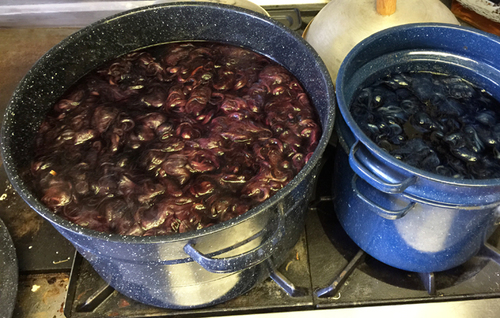 Once the water begins to turn clear, the fleece has absorbed the dye and then it is allowed to cool. It's then rinsed and set out to dry. A carder (not pictured) is then used to prepare the fleece for spinning. The carder aligns the fibers and creates a sheet of fiber called a batt that is almost ready to spin. Roving (strips of fiber) are pulled off the carder and the fleece is ready for spinning. Modern spinning wheels have changed very little since ancient times. Sure the materials, the quality, craftsmanship have improved some. But at it's core, the spinning wheels we use today are the same as those used by our ancestors. The roving is spun into single strands of yarn onto a bobbin. Once two or more bobbins are full, those single strands are plied (twisted together) to make the final yarn. Fleece soaking in a dye bath of two different colors. 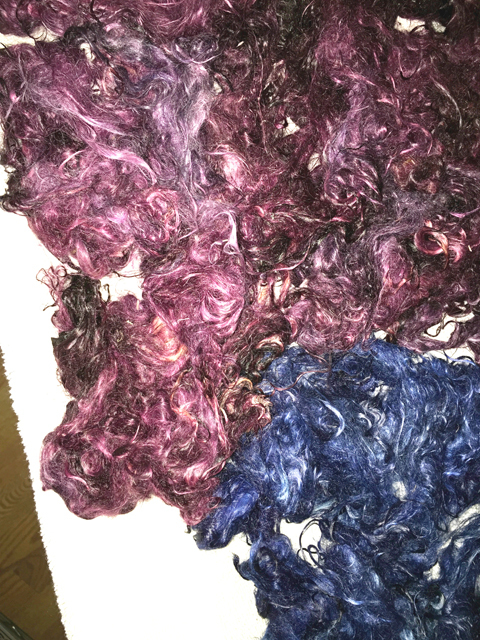 The dyed fleece is dried and is ready for processing. The fleece is processed into roving on a carder and then is spun into yarn on a spinning wheel.